Despite numerous recommendations, I admit that I never bothered to read the Davinci Code. Even when they made it into a movie, I waited until it came out on dvd before finally seeing what all the fuss was about. One of the scenes I remember well is when Tom Hanks and Audrey Tautou discover the waiting members of the Priory of Scion at Rosslyn Chapel. Before coming to Scotland, I was not surprised to learn that Rosslyn Chapel was attracting plenty of tourists long before getting Davinci Code publicity. Not only was it was a key stop among wealthy Victorians who were exploring the rich architecture of the Borders, but it was also an important pilgrimmage site for its connection to the Knights Templar, Free Masons, and the Holy Grail. I’m not the type to believe in conspiracy theories, but after visiting it in person I can tell why so many people believe there is more of a story to this beautiful building. The number of carvings and their beauty and precision is incredible for such a small church in a small village. It’s about a 40 minute bus ride from Edinburgh City Centre. The 15th Century Rosslyn Chapel was initially intended to be much larger, but its founder, William St. Clair died before it could be completed. Inside the chapel, there are 110 green men carvings. The exact meaning of them is not very clear, but they usually appear as a face with greenery around them and roots protruding from the mouth. They’re thought to be a symbol of fertility and renewal, and are believed to be pre-Christian in origin. It might seem odd to find pagan symbols in a Christian church, but these green men can be found in many other UK churches. There are many other Christian rituals and symbolism that can be traced back to pagan traditions. The chapel itself is filled with images of animals and nature. There is a carving that many believe to be corn / maize from many years before North America was discovered. Some take this as proof that William’s ancestor Henry had visited North America – some suspect that Henry was a member of the Knights Templar. There is also a legend about the carved pillars in Rosslyn. St. Clair wanted one of the pillars to be based on a design that he had seen in Rome. Before beginning the work, the master mason wanted to study the pillar for himself so he journeyed to Rome. Travelling was far more difficult in those days, and such a trip would have taken him years. While he was away, his apprentice wanted to carve the pillar himself and when the master mason returned, he saw a pillar that overshadowed his own and flew into a rage. He struck his apprentice on the head with a mallet, killing him. The mason was convicted of the murder and executed, and a carving was produced so he would be forced to look down on his apprentice’s pillar for all eternity. The crypt below the chapel has been sealed for centuries, which has fueled rumours of what might be buried there. It could be the remains of Mary Magdalene, the treasure of the Knights Templar, or even the Holy Grail itself. No one really knows. An extensive search for an entrance was made in the 19th century, but none was found. I don’t really believe in these myths of the Knights Templar or Free Masons, but Rosslyn Chapel is an architectural marvel and more than a fine example of medieval masonry. Its amazing how much of it has been preserved considering it was left empty for so many years. 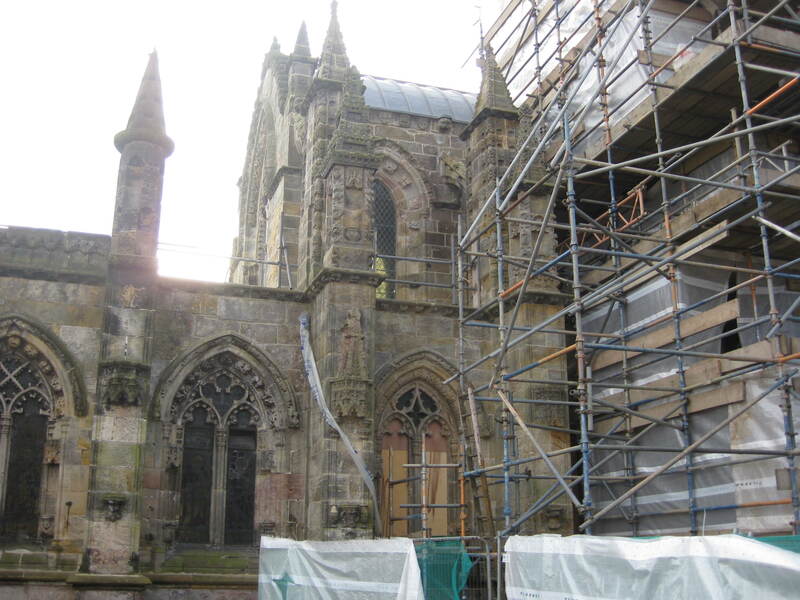 Due to a problem with the damp, a protective cover (recently removed) was placed over it for nearly ten years while restoration work was done. Conservation work is still in progress, but most areas were accessible. A new cafe, gift shoppe, and ticket center was also built to accommodate the tens of thousands of tourists visiting the chapel. With my hostel being right there, I did manage to explore the famous red light district quite a lot, but none of the other nights really compared to the Friday – the atmosphere was electric until probablly 4 am. I didn’t get much sleep that night, but not for the reasons dirty minds would expect; my hostel room had big windows that were open to the street, and no one was in any hurry to close those because of how hot it was. There were also revelers coming into the 12 bed dorm until like 4 am; early risers were getting up and about by around 6 am. You really couldn’t help but take in the excitement. I did a lot of walking on this trip. The zoo was actually pretty fun; its an old victorian design so there are some parts that are quite pretty even if it doesn’t smell great. Plus, a lot of people in Amsterdam go there for family outings, and there was a pretty good vibe throughout the place – nothing really seedy going on. Its the polar opposite of the Red Light District. After a bite to eat we stopped at a little bar where we had a great bartender who gave us some very tasty shots, including a mini guiness and another flaming shot that i don’t remember the name of. Also, I stopped briefly at one of the coffee houses; good brownies, but the night was not as wild and crazy as that scene in the movie EuroTrip. He wanted to be sharp when he met his new boss. It was good to catch up with Bill and with any luck we’ll meet up again soon in Africa. Bill had an early flight and I was on my own again on Monday. Before he left, he dropped off an important gift. It made me feel like I was back in Canada: I spent 45 minutes of my Monday morning reading the Globe and Mail at what felt like a kitchen table. This day though I was carrying my backpack through my wanderings because I checked out of my hostel at 10 am and didn’t want to pay for a locker at the train station – I had to stop and rest more. I know its not just Amsterdam, but it would be really helpful if there were a few more public washrooms and public benches. Its annoying that you have you to pay 50 cents to use the washroom at KFC of all places. In this sense, I say screw the free market, supply and demand bull. As a tourist, sometimes I just want to sit somewhere and rest myself or use the facilities without having to buy anything. Its a minor annoyance I know, but there is a principle behind it. That’s why some of the best times are had outside the tourist areas; not only are you mingling with actual residents, but there are actual public services – less gouging. I’m sure there is plenty more to Amsterdam that I didn’t see – maybe next time I’ll see if I can get into a bit more trouble. Now though, I’m back in Scotland. I guess for most people it would be tomorrow, but its been July 14 for about an hour or two and I’m just too excited to sleep. I tried going to bed twice but I’m having a little trouble shutting my mind off. Unless I come up with a last minute brain wave, I’ve packed my bags with everything I’ll be taking with me. There is a lot of stuff I’d rather not leave behind, but I guess its in my interests to travel a bit lighter. I keep wondering what my life will be like just a few weeks from now. For the past few months I’ve been thinking about this little adventure, and now that its almost here I still can’t bring it into clear focus. Reading usually helps me think more clearly, and I started a Michael Connelly book on the ferry the other day, so I expect I’ll be spending a lot of time with Harry Bosch over the next 24 hours trying to figure out who the serial killer is; considering the long flight and time waiting in airports, I might be finished the book by the time I land. The last few weeks have been mostly devoted to getting the hay off the field, which still isn’t finished. There are still three or four loads of hay on the last field below the house. I’m feeling pretty strong now after throwing hay bails for two weeks; its not really enough time to get ripped but my arms definitely feel longer after lugging around and stacking some of those heavy ones. I’m not sure what the final count will be, but its one of the best years in a long time and dad should have no problem with the last few hundred bails – last week, we were wondering if there would be places to put all of it. I really should be sleeping right now because I’ll need to catch an early ferry off Denman Island to connect to my flight from Nanaimo to YVR; that will get me to the airport 3 hours before I my flight to Glasgow, Scotland around 1 pm. It’ll be around 6 am local time when I land on Thursday. I’ll be in Edinburgh later the same day. I’ve never been able to sleep very well on airplanes, and its quite possible I won’t sleep again for more than a few minutes until Thursday night. While I wait for my train in Glasgow, I’ll be sure to grab lunch and a pint of a strong local beer – get this trip started right.